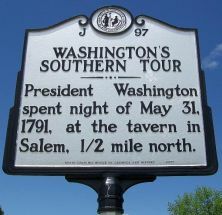 President Washington spent night of May 31, 1791, at the tavern in Salem. 1/2 mile north. While on tour, Washington sought differing viewpoints and wanted to see and be seen by as many people as possible. Soon after taking office, he planned and undertook a successful 28-day tour of New England. 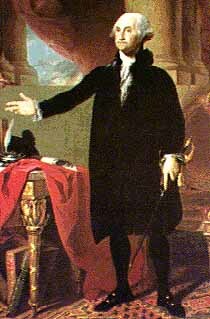 In early 1791, after establishing a site for the new “Federal District” along the Potomac River, Washington embarked on a tour of the Southern states—a product of his desire to visit every state during his term of office. Proceeding from Mount Vernon via Fredericksburg and Richmond (Virginia) into North Carolina, Washington crossed the Roanoke River into Halifax in mid-April 1791. From there, the President’s carriage tour took him through Tarboro, Greenville, New Bern, Trenton, and Wilmington before entering South Carolina. Washington re-entered North Carolina near Charlotte and traveled northward, visiting Salisbury, Salem, and Guilford Court House. Washington left Salisbury early on the morning of May 31, 1791 and arrived in the Moravian settlement of Salem that afternoon. He was met on the outskirts of the Moravian settlement by three ministers and, as he approached the square, the President was entertained by trumpets, French horns, and trombones. Stepping from his carriage, he “greeted those who stood around in a friendly manner, showing his good will especially to the children who were there,” according to the official town diary. Washington noted in his own journal the number of artisans in the village and took time to visit the shops of the tradesmen. 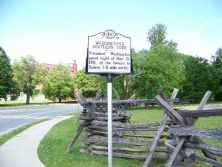 At the tavern, where at his request the musicians again played for him as he dined, the President awaited Governor Alexander Martin who arrived the next afternoon. From Salem, Washington continued northward toward Rockingham County and Virginia.